Dollar Cost Averaging - What Does It Mean? 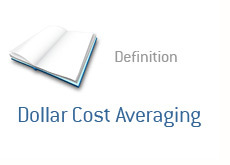 What is "Dollar Cost Averaging"? Dollar cost averaging is when you invest a certain amount of money in a stock over regular intervals, rather than investing all of your money at once. You decide that you would like to purchase a long-term position in Microsoft, however you are a bit worried that the markets may continue to trade lower over the next six months to a year. You have allocated $20,000 of your investment capital for this purchase. You decide that you are going to use "dollar cost averaging" to buy into this position. You decide that instead of buying the entire $20,000 position at once, you will instead buy $2,000 worth of the stock each month for a total of ten months. This way, if Microsoft continues to trade lower along with the markets over the next ten years, your average price in the position will be lower than if you just invested the entire $20,000 today. That is dollar cost averaging. The idea of dollar cost averaging is to reduce variance, however experts are divided as to just how effective this practice is.